Connect your data to cloud. Compose your storage infrastructure with existing hardware, not procure new storage. By separating your compute and storage, provision storage of any kind as needed by application at that time. No more wasted islands of storage as in Direct Attached storage. Respond quickly to changing workloads with multitude of features available at your finger tips. With unified storage protocol and technology support, provision storage with confidence. Flexible LUN provisioning even with raw files, VM images. No more hard requirements to use block devices only. Scale Any legacy storage LUNs by adding NVMe cache tiering. Deploy with confidence as it fits easily into your data center. Network agnostic and storage vendor agnostic. Works with infrastructure of your choice. Connect to heterogenous cloud from single profile. Data security with encryption at rest and in flight. Build highly available, and scaleable NVMe over Fabrics solution using MayaScale. 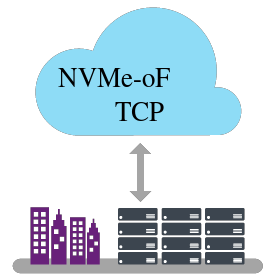 Our software defined block storage solution provides real NVMe device to clients from centralized pool of NVMe devices. High performance, High available NFS server on-premises or in the cloud. Cloud native NAS file storage solution to provide compression and deduplication with EBS or Object storage. With advanced snapshot and replication setup Hybrid Cloud NAS. Comprehensive software defined data platform with support for block storage (iSCSI, NVMe, FC), file storage (NFS, SMB), tape storage (VTL) and multi-cloud object storage. Excellent choice for getting data in and out of cloud. Easy to use with CLI and Web based management.